Maxeler’s Multiscale Dataflow Technology delivers unmatched performance per unit space and per Watt for high performance computing applications. 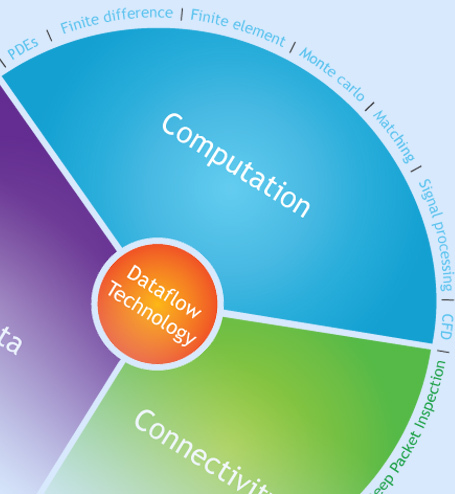 With Maxeler dataflow engines, the algorithm is mapped onto dataflow cores, and data streams from memory through the dataflow engine where operations are performed and data is forwarded directly from one dataflow core to another without being written to the off-chip memory. The dataflow structure not only provides high compute performance, but also naturally optimizes the use of memory bandwidth, so even algorithms that are traditionally regarded as memory bound such as sparse matrix solvers can still be accelerated by orders of magnitude.